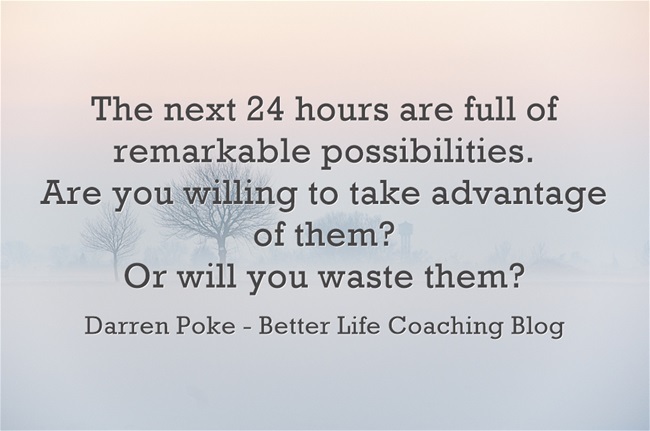 The next 24 hours are full of remarkable possibilities. If you look carefully enough, you can see a host of opportunities available to you to make the world a better place and create a better future for yourself. This could be the day that you take steps towards launching your own business, getting in shape or sorting out your finances. This could be the day that you learn a new skill that will be useful in the future. This could be the day that you use to catch up with a trusted mentor. This could be the day when you are a trusted mentor. This could be the day when you reach out to someone in need. This could be the day when you get your life back on track and revive your flagging goals. Or this could be just another day of wasted opportunities and the same old same old. Always when I need a motivation I come here, read and I never feel disappointed.